Squads from the Wyoming Police Department were dispatched Tuesday morning to a call of a mother in labor at her home, but when he arrived Officer Matt Paavola found the front door was locked and there was no way to enter the house. WYOMING, Minn. — A true set of Minnesota twins have a story that will follow them for a lifetime, after an unusual arrival in the great big world. Squads from the Wyoming Police Department were dispatched Tuesday morning to a call of a mother in labor at her home, but when Officer Matt Paavola arrived, he found the front door was locked and there was no way to enter the house. Knowing the situation could be urgent, Paavola kicked the door open and found Nichole Mickelson on the floor. The Wyoming P.D. Facebook page picks up the story from there. With a swift kick to the door, the officer (Paavala) forced entry into the house and found the mother had just given birth to a baby girl. The newborn was in the mother’s arms and not breathing. We train as first responders to handle these calls, to deal with a mother in labor or to perform CPR on a person in respiratory distress. Dealing with both at the same time is extremely rare. The officer sprang into action and began CPR on the newborn baby girl Anna, clearing the airway, giving mouth to mouth and compressions until she came to life with that familiar newborn cry. But the story doesn’t end here. As the officers (Officer Scott Boecker had arrived on scene) were performing CPR on the newborn, the mother shouted out the second one was coming out. Yes, that’s right, a second newborn. 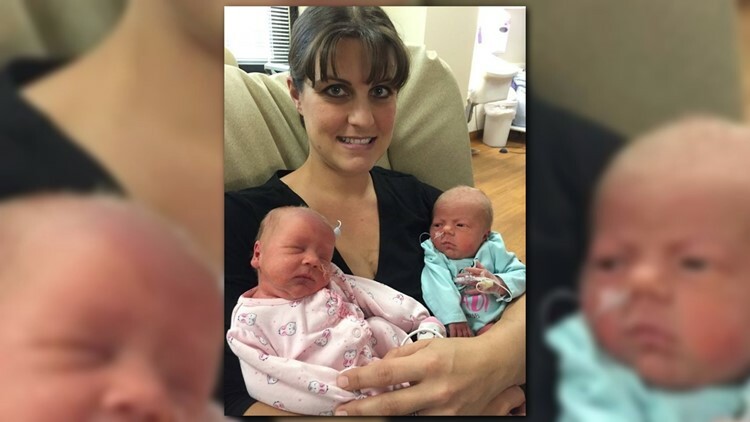 Unannounced to the two officers, the mother was pregnant with twins. With the first newborn baby breathing on her own, the officers switched gears and delivered the second newborn baby girl Ashley. Police Chief Paul Hoppe says it's his job to make sure his officers have the necessary training to do their job, and maintains that Paavala and Boecker performed "flawlessly, professionally, without hesitation, with care and compassion to the family." "The Mickelson family have one heck of a story they will probably carry with them for a lifetime," the chief added.